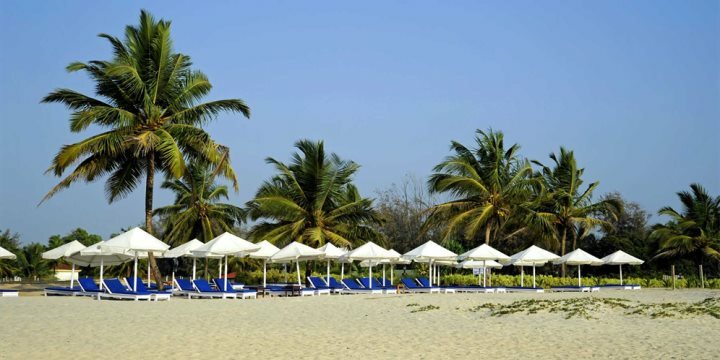 Located to the south of Cavelossim beach, where things get even quieter, you’ll encounter the wonderful and peaceful beach of Mobor, a perfect sandy retreat for those on holidays in Goa. Home to the breath-taking hotel, The Leela, the serenity and beauty of the property is continued along the sands of Mobor and out to the ocean, where if you’re lucky you may spot some resident dolphins. In between bouts of sunbathing, ducking into one of the beach’s colourful and welcoming shacks for refreshments is a great way to get a taste of some authentic Goan cuisine. If you continue wandering along the sandy peninsula of Mobor, you’ll eventually reach the point where the River Sal meets the ocean. If you fancy a few hours away from the sand, the river provides an interesting opportunity to encounter some diverse Goan wildlife, with boat trips regularly travelling upstream to spot the likes of Goa’s gigantic bats. Please find below a selection of our accommodation in the resort of Mobor in South Goa.